In der Boreanisches Tundra gibt es bei 55.74, 88.13 in etwa 10m Tiefe eine Unterwasserhöhle. Diese Unterwasserhöhle macht einen Knick nach oben und endet dann in einer unterirdischen Höhle, an deren Ende du ein Weißes Murlocei findest. Wenn du das weiße Murlocei benutzt, schlüpft daraus Terky, der damit deinem Wildtierführer hinzugefügt wird. Deutscher Guide um das Haustier Terky zu erhalten. Terky befindet sich in einem Weißes Murlocei, welches sich in einer Unterwasserhöhle in der Boreanische Tundra in Nordend befindet. Der Eingang zur Höhle ist bei ca. 55,88. Am besten portet euch nach Dalaran (z.B. mit Band der Kirin Tor) und fliegt dann zur Valianzfeste zum Greifenmeister Tomas Strombrunn in der Boreanische Tundra. Von dort aus müsst ihr selber weiterfliegen in Richtung Süden, hinaus aufs Meer, bis ihr einen Turm seht. Beim Turm müsst ihr ins Wasser und den Eingang suchen, der sehr schmal und schwer zu finden ist. Habt ihr ihn gefunden schwimmt rein, dort geht es dann wieder nach oben und ihr befindet euch in der Höhle. Lauft bis ans Ende der Höhle. Das Weißes Murlocei liegt hinter dem Tisch in dem Haufen mit den Knochen. Beim benutzen bekommt ihr Terky als Kampfhaustier. Another Murloc Pet? :D I would KILL to find out where we can get this. I really really REALLY hope thsi makes it live to servers. wow! maybe another version of "Lurky" for those that where not on EU Servers? Sadly not available :( It was obtained through an 'iCoke' promotion (iCoke-Gewinngutschein einlösen) which has long been removed from the game. Oo-er, me and a mate just had this quest pop up a minute ago whilst doing Tol Barad, so the quest still exists. Anyone else had this today? Answered my own question. Obviously some had held on to it and shared it just to be "funny." Fair enuff. Oh my god. If we can get Terky.. sure, it's not Murky the one I remember seeing in Vanilla and going ¨I need this in my life¨ But it's still a proper murloc pet without the armor and stuff.. This finally made its way into the game. Coords 55, 88 in Borean Tundra. The northeast tip of Riplash Ruins. If you swim down about half way you'll see an indent into the stone wall. (It's kinda hard to see if you're not exactly sure what you're looking for so be prepared to search for a bit) Swim in towards that and you'll be in a cave. Follow that around to the end and you'll see a large pearl/egg thing. That's not it. Go around behind that and you'll see an egg in a pile of stuff. That's where you get Terky. if you are having trouble with the crapton of people getting him, just find somebody with the garrison trader up in LFG, join that group, and usually it'll phase out enough time where you can click and grab. Take note- it is NOT that big pearl on the stone slab. It is BEHIND it near that red and white seashell. and then there were people sitting at the spawn point of said egg, and trolled the heck out of everyone in less than an hour. If you're trying to get this, wait til everyone is done %^&*ing around. And of course, because people in this game are just vile human beings, everyone proceeds to drop EVERY TOY IMAGINABLE right on top of the egg so that nobody can see it and click on it. Because why not just get your pet and go when you can make everyone else on every linked server miserable? I used realm hopping to grab mine. It's taking some patience to find a sever where he's either not being stacked on or just really low pop, but don't give up! He's so cute! Despite the seething mass of Tauren-sized griefers I managed to get the egg by standing at 54.61, 89.43, facing Northeast. Hover your mouse around until you get the cog. Then right-click it until someone isn't using it. Finally! Getting lost, plus multiple deaths and a PvE group later... I entered the cave and stood behind the platform which was filled to the brim with players. I moused around until I saw the cogwheel show. Left my mouse there and waited, then shift-clicked as soon as it came up... and there it was. My very own Murloc pet! Immediately took him to IF to hang out with Murky and Ransin Donner only to find out Terky dances as well! Squeee! This is the best day ever! You do not have to be subscribed to the game to get this pet. I just used a low level ally toon to hop on the boat and swim to the cave since there are no aggressive mobs in the way. so long as you have the LK xpack you can get in. Just got mine on the Sisters of Elune server... my gosh the amount of people camping the spot is ridiculous. Thankyou to everyone who posted Re: location and how to get it. Location: Look on minimap. My character is right where the entrance to the cave is. Good luck! Use your Magischer Haustierspiegel and /dance. To obtain Terky, what you are looking for is a white egg on the ground inside the cave that contains the Weißes Murlocei. Don't let the pedestal with the large pearl fool you - the egg is in the pile of debris (seashells, rocks) off to the side, on the ground. Note that Terky is unique - only 1 per account - and NOT cageable. After you get the first one, there is no point trying for another. Zoom all the way in (forward on your scroll-wheel), and move your cursor slowly around the area - you are looking for the egg which will have a cogwheel icon over it. If you do not have a scroll wheel, the default keyboard shortcut for zooming in is Shift + '=', and zooming out is Shift + '-'. If you play with your camera zoomed far out, you'll have to press this shortcut many times before anything seems to happen. The egg despawns when looted, but instantly respawns. There is a short cast time when looting. Once you have found the egg, simply wait for a respawn and spam right-click it - eventually you will get the cast bar, and you should be able to loot it. If you do not have auto-loot on already, holding Shift and then right-clicking will auto-loot the pet for you. For those on a PvP server, especially when your faction is outnumbered, the group finder tool is very helpful. Simply find a PvE server to switch to so you can search at your leisure. It's advisable that you do this well before arriving at the cave to avoid any ganking shenanigans or painful surprises! Even if you are not switching off of a PvP server, realm hopping by using the group finder is a great way to see the egg more clearly. When you switch realms, all players on the original server you are leaving despawn and for a brief second or two you can see the egg clearly. Use this to your advantage to locate it. Good options for groups to join via the Group Finder tool are those opening their garrisons to others for the trader/enchanting/pet battles, etc. If you happen to have any, Junges Gemüse is a good way to deal with annoying characters standing on the egg - this item shrinks any character you apply it to! These consumable items are sometimes found in the Kleines Gewürzsäckchen awarded by completing the Dalaran cooking daily. They can also be purchased in the Auction House. If you was planning on caging it to sell it. It's not cageable and you can only have one. This looks identical to Lurkys Ei which could be obtained from the Burning Crusade Collector's Edition. Kind of a bummer for people like myself who had it, as now the model is no longer unique/rare. Warning! The Cave is a death trap at the moment, at high populated servers, you'd better get a raid group or join a x-realm group. Note that it's in a CAVE underwater, so once you reach the big tower you should look at the sea. you will see a big rock at the basement of the tower. dive in and near the surface you will find the fallen coloum with the sea weeds, behind the weeds there is the entrance of the cave. Edit: Added the link to the screenshot to the actual post. You can have only one Terky. Got mine just a few minutes ago. No camping needed at all. A tip is to download "cross realm assist" from curse client and use that addon to server jump. That way you can go from server to server untill you find the egg! There is a CROWD of players in the cave. So, you may use Cross realm assist addon to switch realm and take an egg with no time wasting. I am on Darkspear - a PvP realm. I connect to Darkspear from Taiwan; 9PM Taiwan time is very early in the morning for Darkspear players. I had no issues with this as there were only four people in the area. I went to the back of the cave, opened cross-realm assist started hopping with my mouse in the position and clicked when the cogwheel appeared. It took about 10 seconds. Going to state the obvious but be prepared for the carnage. If you are lucky it's your faction camping the spot right now. Go to 55.91, 88.07 in the water and then just swim straight down while looking at the rocks. You'll see a broken statue, seaweed and a rock. Swim right through the seaweed and then just follow the path up into the cave. "6.2.2, barely lasted a month and a half. The next one will be... sneakier. #KeepWoWMysterious"
I'm so happy to finally have a Murky-type murloc pet! I even named mine "Finally'. Terky is capable of doing the funny, super cute Murloc dance! The reason why I always wanted one! The reason why ANYONE should want one! Why does this have to be confirmed? Because it just took me 43 freaking minutes of standing idle in order for it to happen! I used the magic pet mirror on him and use /dance.. it was quite amazing. Spawns within few seconds, so don't leave if theres people waiting on it. Beware of the opposite faction, they might attack. I didn't have an active WoW account, but I've wanted a baby murloc pet for years, so I decided to try and get one anyways, but without paying for a month. I logged in on a level 12 monk who was in Orgrimmar, took the Zeppelin to Borean Tundra, used a death far enough away from Warsong Hold to teleport and grave rez nearer to the coast with the green seaweed Vrykul dudes, then corpse hopped into the ocean, mounted my sea turtle, and swam over to the location. It took a little while, but I was able to loot and learn it! I now have an adorable baby murloc pet! YEAAHH! Don't let having an inactive account stop you from getting this little cutey, lol. The name is an obvious reference to George Jefferson, who would often refer to white people as turkeys. Given the color of the murloc, this is actually quite clever, though I'm uncertain why anyone at Blizzard thought this was okay in the year 2015. 100% thought this was a joke as I first saw it on imgur. If you want to obtain this pet but are currently on a break from wow, you can do so without having to resub before you're ready to! Just log in & make a level 1 human (remember that characters level 20 & below are free to play just like on trial accounts). Run to Stormwind Harbor & hop on the boat to Borean Tundra. Once you arrive at Valiance Keep, swim south to Riplash Ruins. Entrance of the underwater cave is at 55,88. You won't encounter any mobs on your way. I just did this on my husband's inactive account & it took less than 15 minutes. If you have an heirloom mount it will take even less time. Enjoy your Terky pet which will be waiting for you when you choose to return to the game! Terky was once a promotional companion/pet released with iCoke Taiwan. However, since patch 6.2.2, it is available for any player to obtain. To obtain the Weißes Murlocei, for the battle pet, Terky travel to Boreanische Tundra, Northrend. •	If you are Horde, you can take the Zeppelin from Orgrimmar to Warsong Hold. •	Alliance will take the boat from Stormwind to Valiance Keep. •	Otherwise, just port to Dalaran and fly to Warsong Hold / Valiance Keep. 1. Once in Boreanische Tundra, travel south to Riplash Ruins to the coords of 56.5, 87.9. Jump into the water and enter a cave, located behind some seaweed. 2. The cave entrance is located just below the surface of the water at coords 55.7, 88.1. 3. Travel in the cave as far as you can get (the cave does narrow), and at then go up above the water . 4. Follow the path (above water) to coords 54.6, 89.3. •	NOTE: There is a pedestal that has a large pearl on it, this is NOT the Weißes Murlocei. The Weißes Murlocei is located behind it, on the ground. 5. Loot Weißes Murlocei and click on it in your inventory to obtain Terky. More exact coordinates: 55.88 88.01, then take a dive straight down. Then you follow for those clues in the other posts. Lets hope that adding this was a mistake and that Blizz removes the egg but lets the users who have it keep it :) If everyone has it, the pet isn't as fun to have. They don't remove enough pets these days. Furthermore, where are all the pets that take days to farm? (Think Emerald/Crimson/Dark/Azure whelplings.) It can't be that hard to add a pet with a real low drop rate, and it will give pet collectors something to do! I don't comment often but I wanted to personally take the time to thank the blizz staff for making this a reality. Many of us have wanted a murloc pet in game (outside of promotional material) for some time. I'm sure I am not the only one that is so very grateful. Thank you! Terky is hidden away in a cave in Boreanische Tundra in Northrend. Once you are inside the cave, you can find a treasure that gives you the Weißes Murlocei that teaches you to summon Terky. Terky shares the model and skin with the rare Burning Crusades' collectors edition pet (EU only) Lurky. Both these pets do occasionally equip a top hat and a cane, and start dancing. This dance is interrupted if your companion starts moving. If you use the toy Magischer Haustierspiegel to turn yourself into Terky or Lurky, and do the "/dance" emote, you will equip the top hat and cane, and start doing the same dance. Up until patch 6.2.2, this companion has only been available through the iCoke promotion in Taiwan. To find the cave-entrance, go to the coordinates 55.8, 88.1. This will put you in the ocean, just next to a tower on the "Riplash Ruins" islands. Once you are at the coordinates, dive straight down. You will see a broken pillar and two corals with some seaweeds in-between them. In the rocks behind the seaweeds, there is a thin crack with two additional purple corals on the wall. Swim into this crack. Once you are at the end of the cave, it might seem like a dead end, but there is an opening righty above you that's hard to see until you are all the way inside. Swim up, and you are inside the cave where the treasure with Terky's egg is hidden. 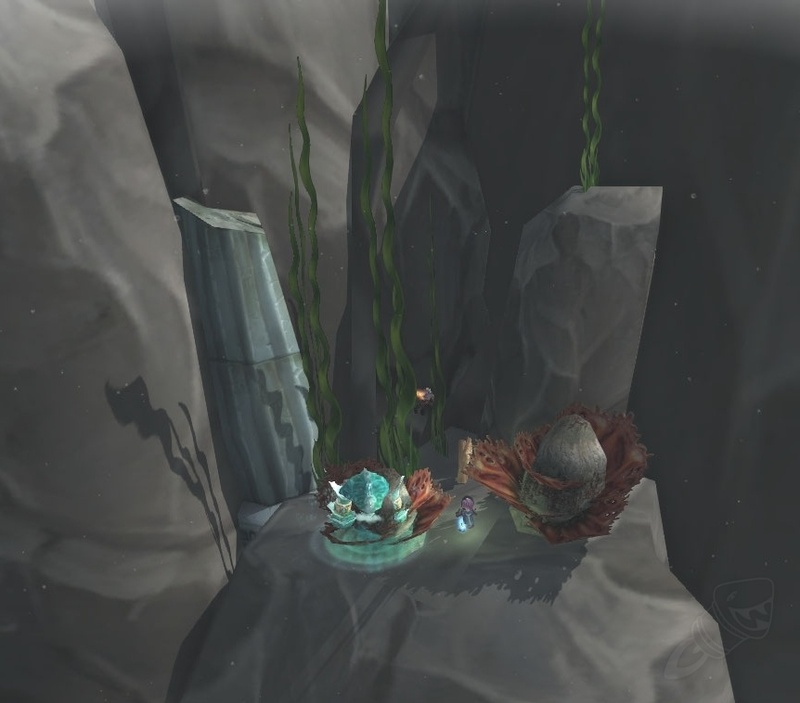 Once you are inside the cave, there is a stone table with a shining egg on top of it. Though it may seem like it, this is not the egg! On the floor next to the stone table, there is a bunch of seashells gathered in a pile. In the middle of this pile, you can find the treasure "White Murlock Egg". Here is a video from MMO Champion showing the model, dance emote, and how/where you can locate the egg. When you loot the treasure, you will get an BOA item that just like the treasure, is also called Weißes Murlocei. After you use this item, you will learn to summon Terky. You should note that Terky is a unique companion, and can't be caged! This means you can only get one per account, even if you try to get it on other characters! Please note that even though you can click on the treasure multiple times, you will not get any additional Weißes Murlocei's! Even though the treasure respawns after a few seconds, please let other players get a chance to loot it instead! This pet is also possible to obtain on level 1 characters, as well as on Veteran Accounts (inactive accounts) and on Starter Editions (trial accounts). Video which shows where to find the entrance to the cave, and where the Murloc's egg. -In the Northeast corner of Riplash Ruins there's a large, tower-like building containing Ragnar Drakkarlund. -Once you've reached the corals, the entrance is directly to your left. You should be able to see two purple corals in it. Try 55.88 88.14 look for a broken white pillar underwater then swim in a narrow space between rocks which at first doesn't look like it's going anywhere. Then you'll swim up and into the cave entrance it's a small cave no problem finding the egg when you get to it. Benutzen: Lehrt Euch, wie man Terky beschwört.